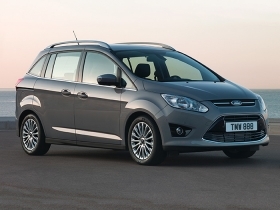 Ford C-Max is a fine vehicle… but just what exactly is it? Come to find out, Chrysler considers it a truck. It sure looked like a car to me. Which brings me to the Ford C-Max -- the vehicle that lands in the United States in 15 months. It will be based on the Grand C-Max, which Ford is launching in Europe. I recently had the opportunity to drive the Grand C-Max in Nice, France. Like the PT Cruiser, I'm not quite sure how to define the C-Max. The Grand C-Max, now launching in Europe, may be called the Focus C-Max when it arrives in the U.S. market in January 2012. The C-Max is built on the compact car platform shared with the Ford Focus car. The C-Max will have a 2.5-liter four-cylinder and an optional 1.6-liter EcoBoost engine. Both powertrains give it a peppy and nimble drive similar to a car. It's expected to earn good fuel economy, again similar to a car. The C-Max is easy to maneuver, and the driver is seated lower than he or she would be in a typical minivan. It has a tight turn ratio that feels similar to -- you guessed it -- driving a car. But the C-Max seats seven people. It has rear sliding doors (similar to a minivan), folding interior seats to reconfigure space inside (again, similar to a minivan) and a roofline that's higher than that of a typical car. It's clearly meant for small young families who want an alternative to a sedan, crossover or large SUV. And looking at it from the outside, to me, it looks like a mini-minivan. The C-Max will compete with the Mazda5, another small, vanlike vehicle that seats six. Which brings me back to my initial question -- what's that?